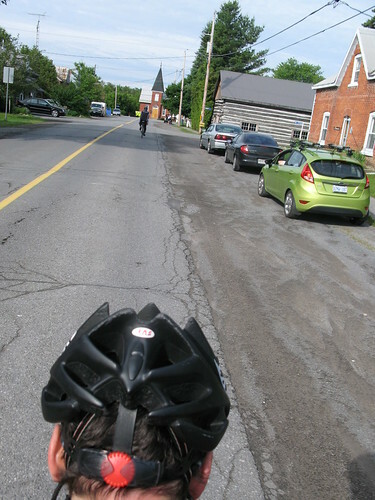 Last weekend was the annual Rideau Lakes Cycling Tour ride from Ottawa to Kingston. We were almost at the registration area and had not seen a single cyclist. “Are you sure we have the right date?” It was the right day, alright – we were just a bit early getting started. What a gorgeous morning. Shadows were slanting across the road, the sky was clear and the air was cool. You could not ask for a more perfect day for riding. It did not take long to work our way out of the city and onto country lanes. Mary bought a new Brooks bag to fit under my saddle. It is perfect for holding the camera, trail food and the like, and she can access it while riding. I pedaled slowly while she extracted the camera, took some photos from different perspectives and returned the camera to the bag. The experiment was successful. We even got a shadow portrait (tip of the hat to Alan 🙂 ). Ashton is the first stop on the route. Riders were coming in twos and threes. The big pelotons had not started arriving yet. Everyone was feeling good. We stayed just long enough for a personal break and application of sun screen before rolling on. Mary left her gloves behind on a railing. It was an opportunity to ride back through the village again and get a few photos. Halfway to Perth a lone rider latched onto our rear. That was fine with us. He was friendly and struck up a conversation. Even better, he could ride with one hand – we handed him the camera and to take some pictures of us. A disadvantage of the tandem is that we never get photos of ourselves riding. One rider can’t stop for a photo-op and take a frame of the other. These are our first true photos in motion. 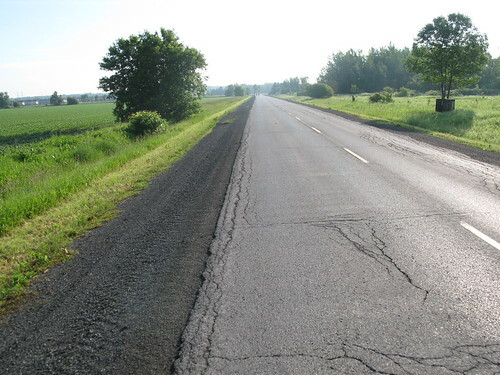 Perth, the second stop of the ride, is almost halfway to Kingston. In Last Duel Park the local community service groups had sandwiches and cookies for sale. It was time for a break before we hit the rolling hills. Lady CoMo is a bit like a truck. It takes greater effort to accelerate, but once you have built momentum you just keep on rolling. When we are climbing, if Mary is still chatting (she’s a pathological chatter), I will call out “C’mon Little Engine!” and she will kick in. She stands at the back to get us started up the hills, then I stand to bring us closer to the top. We played leapfrog with fellow riders who would pass us on the climbs, and then we would shoot past them on the descents. Some of larger groups of riders would ride side by side. A couple of times on the big hills we couldn’t maneuver around them and lost our momentum. Frustrating. Captain rides in front, controls the tandem and is responsible for the safety of the riders. Also extremely vulnerable to attack from the stoker. Stoker back-seat rider, provides power and information to the captain. Also controls the captain, and therefore, ultimately, the tandem. Somewhere past Westport we hit a downhill bump in the road. It was my fault – I am the captain. Mary had the camera in her hands. The bump lifted her from the saddle. Her leg must have jerked severely. Her dominant right leg was pretty much out of commission. I had lost my Little Engine. At Perth Road Village, the last rest stop, the rain started. At least it wasn’t cold and it wasn’t too heavy. We still had 30 kms to go but the hills were behind us and the gradient tended downwards towards the lake. We made it into Kingston by 4:30 pm, 10 hours after leaving Ottawa. Our dormitory had no access ramp – I had to carry Lady CoMo up two dozen steps to get to our room. Grumble. On Sunday We started the return ride gently. Mary’s knee was still tender and I did not want her to stress it. More riders passed us than yesterday – a lot of them called out encouragement. Quite a few men told us of their own tandem at home in their garages – their wives won’t ride. That’s another difference when riding a tandem – you get a lot more chit chat from other riders. We actually made decent time all things considered. However saddle soreness was becoming an issue, particularly for Mary. Normally she can alternate between leaning on the handle bars and sitting upright to get some saddle relief. Now her knee was excruciating whenever she sat upright. Westport Hill is the big psychological challenge of the RLCT. It is a long, steep climb (by Canadian standards) and you hit it right around noon when the sun is merciless. Our new gearing worked wonders. Even injured we were able to winch our way up the hill (I love that phrase, Chris). At the top we had a double bonus: we had finished the climb and there were 20 kms of gently descending hills in front of us. We were able to use our big gear and really capitalize on the descents. By the time we hit Perth we were tired. And hungry. We bought two sandwiches and I ate most of Mary’s. That was neither wise nor chivalrous. We were both suffering from the saddle. To give Mary saddle relief we started to coast regularly with one foot down, but the relief was only momentary. And when we sat to restart pedaling I had to rebuild our cadence very slowly to avoid hurting her knee. From a plane this stretch of country looks lush in the slanting evening light. Copses of trees and scattered woodlots break up pastures. 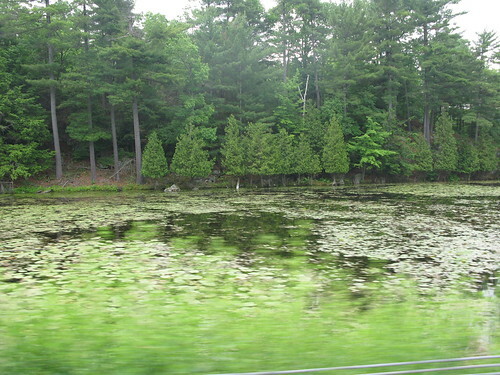 Small ponds dot the landscape and the silvery Jock River whorls its lazy way back to Ottawa. From the ground the landscape is almost flat. It is picturesque in passing , which may be a polite way of saying that it’s boring when you are tired on a hot afternoon. At Ashton – our last stop – we were sitting on the grass in the shade of a tree with our shoes off, about to bite into a hot dog, when a voice above said “I didn’t know you guys were cyclists.” It was one of those oh-oh moments – you recognize the voice, the face is familiar, but what the heck is the name? “David,” he prompted. Of course. Our former neighbour. He and Sharon took care of our sons when our daughter was birthed. I don’t think we’ve seen him for over 25 years. David is one of about 30 ham radio volunteers who help support the ride. The ride is covered by three repeater towers. His job was to be a “bridge”, passing along messages from one zone to the next. He said they had had the usual assortment of events that day – breakdowns, injury, accidents, a lost wallet. Mary’s knee was not good. We were 40 kms from home and the going was painful. After about a half hour she had to pace up and down the side of the road, limping badly. I suggested she might want to call our son to come get us. That probably was enough to spur her on. She claims I pulled her along for the remainder of the ride but I don’t believe it. I know what it’s like when Mary’s not pushing. I think her left leg was doing double duty all the way home. This may well be our last Rideau Lakes tour. It’s a fun ride but the saddle time is just too much for us – I was numb for hours after. We’ll see how we feel next February when the notices come out for next year’s ride. Posted by Kern on June 15th, 2012. A good read. We need to get out on our tandem. What saddles are you using as a matter of interest? I have yet to find a saddle that is comfortable on a tandem. Hi Rachel. Thanks for the comment. Out saddles are Brooks B17s. We chose them very carefully – they were the only ones that came in honey brown 😳 . Garry had a good post last year on how to break in a leather saddle (soak in oil for a week and walk on it with your heels if I remember). You may want to consider a ThudBuster for the stoker. I don't have a photo handy at the moment. It is a trapezoidal piece of rubber that absorbs unexpected shocks. It has been very effective for us. Garry's leather saddle advice. Not sure about the oil though. Brooks Proofide would seem preferable (if you can get the tin open). Brooks Saddles (and posteriors) may vary. I prefer a hard-ish saddle (that you don't sink into) combined with the best padded bib tights I can find, although recently I've discovered I can manage a 50 mile ride with unpadded shorts. The important thing IMO is for the saddle to have some 'bounce' – but that's just me... Sandra finds Brooks too hard, even one of my 'soft' broken-in ones. I've found a dollop of Assos Creme can help on a long ride – I'm not sure why but it does. Cycling both ways – that's nearly 230 miles for the weekend. Quite a distance Kern. I hope Mary's knee recovers quickly. And I hope you decide on the Rideau Lakes tour next year, as it's something to aim for physically. 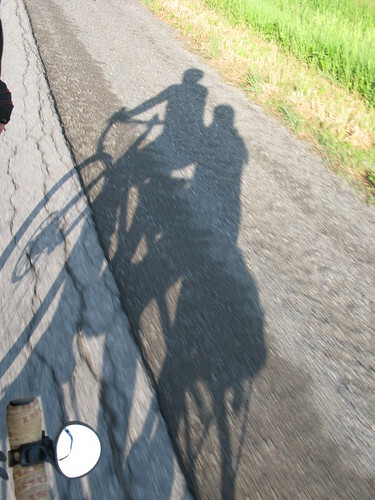 Yes, nice photos from some unusual angles – I've not seen pictures taken from the back of a tandem before. Loved the shadow shot! 230 miles is a long way, especially if you are sitting on the saddle virtually all the time, no wonder you were sore – I'm not sure I could cope with that even with Assos chammy creme! Hope Mary's knee recovers quickly and well done to her for plugging on, 115 miles on an injured knee can have been no fun at all. I've got a standard B17 blue and a B17 Special and both were comfortable straight from the box altho I like the nose slanted down a bit. Great post Kern, Loved the pic of you both on Lady Co mo. Got some lovely pictures on this ride you have. I used to use Brooks all the time. After about 60 miles (once broken in) the pain was unbearable. I now have RIDO saddles on all our bikes (tandem included). I can ride over 100 miles without padded shorts at all, just wearing running leggings or shorts. Cant rate these saddles more than I do.... Cept they are a bit beast ugly. I hope Mary's knee gets better soon. Ouch. I reckon knee pain is about the worst there is. So many moving things and stuff (did I mention I'm not a trained doctor?) giving a unique feeling when things don't go right. Actually, if you've ever had a strain deep in your groin you might think that was nearer the top of the list. It's certainly a scary feeling. How is Mary, more than a week on from such a long ride? Yes, we were a bit disappointed with the 129.1 mph max speed but, you know, Mary's knee wasn't quite up to snuff. Actually Mr. Garmin started acting up intermitently during the ride. The magnet may have misaligned, or the perhaps the wireless batttery needs replacing. In any event its readings are suspect for this ride. Mary's knee is much better, thanks all. 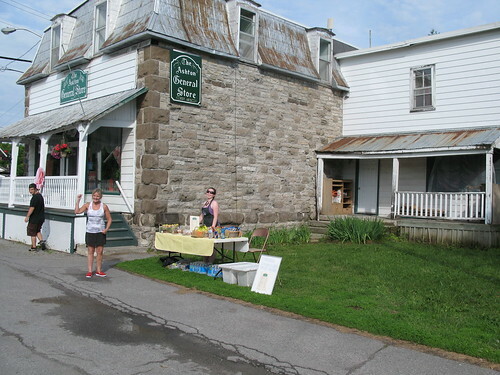 She rode up to Champlain Lokout with her friend Donna on Tuesday and later had a doctor look at it. Perhaps a touch of osteoarthritis, he said. The Thudbuster seatpost really has been excellent. Mary can't see the incoming bumps (and therefore can't brace herself for them). She has never complained about a bump so I figure the Thudbuster has done its job. Btw, I only realized after I posted that the Early Morning photo is actually looking backwards. I didn't think we were riding on the "wrong" side of the road 😀 .